Hi Everyone, happy Friday! 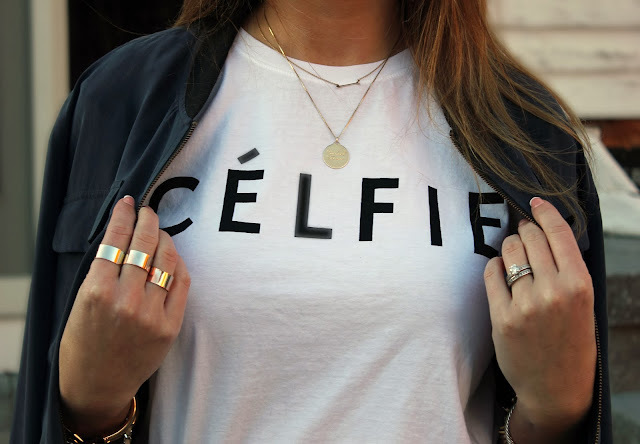 Here are some photos of how I styled the Sincerely Jules Celfie tee shirt I got a few weeks ago. I love all the catch phrase tee shirts that are popular right now as it is an easy way to add a big statement to your outfits. I decided to pair the tee with my Equipment bomber jacket dressing down my skirt for an easy look. This tee shirt was designed by one of my favorite bloggers, Sincerely Jules. I love her laid back style and her outfits are one of my sources of inspiration. Check out her blog here. Bomber jackets are a must have this fall, and I love this one from Equipment. It has a varsity look that is great paired with jeans, but since this one is made of silk, it can also be dressed up as I've been wearing it over dresses.